Poster for the Premiere (October 2009) of the Screen Gems film "The Stepfather"
The remake based on the 1987 thriller "THE STEPFATHER" -- the original written by Donald E. Westlake and "developed" (i.e., story and characters created) by Brian Garfield -- premiered October 12th 2009 and went into wide release the following week. "The 1987 film was based on the real case of John List, who murdered his family and disappeared. I said, 'Why don't we do a story about the NEXT family this guy marries into?' The movie was released while he was still at large, and none of us knew what he'd do next. "Our company - Shan Productions - employed Don to write the screenplay, and then we tried to make headway in the quicksands of the movie business. I'm a slow learner so several years went by. During that interval I finally realized that Don was right -- writers should write, not produce. In the end we sold the property to ITC, with the proviso that they keep Don and his screenplay. They did, and the rest is, I guess, if not history at least a pleasant footnote to it. ITC had the right writer, and they found the right director and the right actor. The film was shot on a budget well under one million dollars. Fortunately budgets have little to do with quality, except in the minds of studio chiefs. "I was thrilled with the movie, and still am. So was Don. I've never met Joseph Ruben, but have stood ready to buy him dinner and a drink any time -- he did a superb job directing it. And Terry O'Quinn was (is) splendid as the title character. And I'm delighted to have my name on it, in however minor a way. "Later (1993), after List was captured and sent to prison, a TV movie-of-the-week about the real case was broadcast ("Judgment Day: The John List Story"). The cop hero was played by David Caruso, but the production toplined, as John Emil List, Robert Blake. His performance as the wife-killer was so convincing it earned him an Emmy nomination. This was a few years before Blake was put on trial for the real murder of his real wife. "Eventually List was caught by publicity from the 'America's Most Wanted' tv series. He was sentenced to 5 consecutive life terms and died in prison in 2008. His motive probably was a combination of damaged ego (he'd lost his job), financial desperation, utter madness, and a religiously misguided sense of morality -- he sent a long rambling confession letter to his pastor after he committed the five murders. Evidently he felt he was doing his wife, his mother, and his three teen-age kids a favor by sending them to Heaven. What he may not have realized is that his cavernous house (which later burned down) contained an original Louis Tiffany skylight that could have solved all his financial problems. That's an irony we didn't know about at the time, but it seems fitting, doesn't it. "In 'Stepfather' Don filled the script with eagle symbols, flags, so forth -- it was his idea to make the character a twisted patriot, who when his family disappointed him, had no problem wiping them out and going on to the next family. Don said he saw the character as the ultimate Nixon-Reagan American. "List, when apprehended after 18 years at large, seemed to be ready to do it again. We didn't know that at the time, of course, but it made sense in terms of the character. "At last count I've had nearly 20 films made from my various scribbles, and several are pretty bad, and several others are better than they have much right to be. Of them all, the two I really like are 'Hopscotch' and the original 'Stepfather' ". 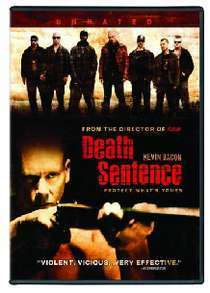 The DVD of the 2007 movie "Death Sentence", starring Kevin Bacon, Kelly Preston and John Goodman, is on the market now. The disk incorporates both the 2007 theatrical release and the unrated director's cut, as well as a lengthy interview with Kevin Bacon and numerous other "extras" about the filming, director James Wan, and other participants. Will Sampson in Brian's CBS movie "Relentless" (1977) --the first feature-length Hollywood production to feature a native American lead character who was portrayed by a native American actor who got top billing. 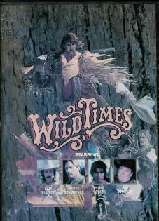 The movie was based on Brian Garfield's novel "Fear in a Handful of Dust"
Sam Elliott starred in the mini-series based on Brian Garfield's novel "Wild Times"
A few pictures. . . .
Brian Garfield and his wife Bina divide their time between homes in Pasadena (California) and Santa Fe. He is happy to answer questions from readers - e-mail briagar@​aol.com. The writer was born in 1939. His first published book was written when he was 18. He grew up in Arizona, earned a Master’s Degree from the University of Arizona, and has lived in various parts of Europe and America. He has published about seventy books, several of them nominated for (or winners of) awards, and numerous short pieces. He is best known for his novels of suspense and the movies derived from them, including "Hopscotch", "Death Wish", "Relentless", "Necessity" and "Death Sentence;" and the original movie "The Stepfather". More than 20 million copies of his books have been published worldwide. He is an Army veteran and a past-President of the Western Writers of America and of the Mystery Writers of America (the only writer to have served in both offices). Nineteen films are based on his writings, and more are in the hopper for 2011 and beyond -- "The Fabulist", based on Garfield's recent biography "The Meinertzhagen Mystery" (Garfield is one of its producers); "Death Wish", an MGM remake written and directed by Sylvester Stallone; an updated remake of "Hopscotch" (Garfield is one of the executive producers); an as yet untitled Baldwin Entertainment Group film based on Garfield's novel "Manifest Destiny"; others as well. The Hyde Park /​ Baldwin Entertainment Group production “Death Sentence”, with Kevin Bacon, Kelly Preston, John Goodman and Aisha Tyler, based on Garfield’s novel and directed by James Wan, was released by 20th Century Fox in September 2007. It is available now on DVD, as are DVDs of most of his films including the recent (fall 2009) releases of the (earlier) original "The Stepfather" 1987 and "Stepfather II". 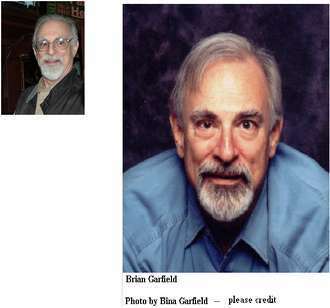 In the 1950s Brian Garfield toured as an itinerant musician with “The Palisades”, a jazz-rock-blues band that had a top-40 hit with “I Can’t Quit” (Calico Records) - they appeared on “American Bandstand” and other programs. He is completing a new thriller for 2011 publication. His most recent new book was THE MEINERTZHAGEN MYSTERY (Potomac Books, 2007; paperback February 2008) and it was yet another departure -- a nonfiction biography of a British hero of science and warfare and espionage whose exploits, Brian discovered and here proved, were largely hoaxes, even though Richard Meinertzhagen fooled many high-ranking friends like Winston Churchill, T. E. Lawrence and Ian Fleming. 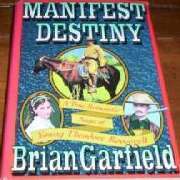 A film about the young Theodore Roosevelt's real adventures as a rancher in Dakota Territory, based on Garfield’s historical novel MANIFEST DESTINY, is in pre-production under the banner of the Baldwin Entertainment Group. Its screenplay is by Emmy Award winner (for "John Adams") Kirk Ellis. Brian won the Edgar Award for "Hopscotch" (best novel; basis for the awards-nominated movie "Hopscotch" with Walter Matthau, Glenda Jackson and Sam Waterston, directed by Ronald Neame; the film was written and co-produced by Garfield) and has been nominated for several other prizes. His seminal novel "Death Wish" defined a crime-writers’ genre and became the basis for a series of five Charles Bronson action-movies. A remake is planned at MGM by Sylvester Stallone. Among his nonfiction books are "Western Films: A Complete Guide," the recent "The Meinertzhagen Mystery", and the classic nonfiction history book "The Thousand-Mile War: World War II in Alaska and the Aleutians," the first full-scale history of the only World War II campaign fought on North American soil; the book was a finalist for the Pulitzer Prize in History, is used by the U. S. Navy as a text on North Pacific warfare, and for years has been the bestselling title published by the University of Alaska Press. And to ask the writer a question, write to him at briagar@​aol.com .